Social networking service Pinterest has responded to concerns over copyrighted material by allowing websites to opt-out of being featured on the site. The site, which bills itself as a "virtual pinboard", allows users to post pictures and other content onto a personalised profile. However, some have raised concerns that the format encourages unauthorised sharing. Concerned sites can now block their content by adding a line of web code. Any Pinterest user attempting to share images or other material from a site with the "nopin" instruction will be told: "This site doesn't allow pinning to Pinterest. Please contact the owner with any questions. Thanks for visiting!" In a blog post, co-founder Ben Silbermann said Pinterest cared about "respecting the rights of copyright holders". He added: "We understand and respect that sometimes site owners do not want any of their material pinned. For these folks, we provide a snippet of code that can be added to any website." In addition to the code, copyright holders can - like most sites featuring user uploaded content - request that material be taken downvia an online form. Pinterest has grown rapidly, with reports from ratings firm Comscore suggesting the site had 7.5 million unique visitors in December, rising to 11.7 million in January. However, concerns over copyright violations have caused some users to back away from using the service. 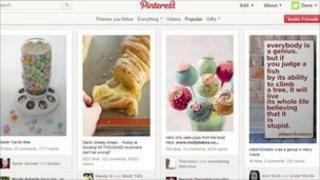 Niri Shan, a media law expert from Taylor Wessing, said he believed the move to enhance measures for rights holders would probably work in Pinterest's favour, should rights holders begin make legal claims. "I think they [the courts] would look favourably," he said. "Overall the court will have to look at the public interest. Blocking sites has implications for free speech - it's not something the court will do every day of the week." Mr Shan added that Pinterest's key approach would be to prove that while copyrighted material might be uploaded to the site, it was not the service's primary function - an accusation made about other sites, such as MegaUpload and Newzbin, in recent court cases. Pinterest - hot new network or another Quora? Are you suffering from 'trendfear'?